Height, overall 2" 3" 4" 6" 7"
Av. Outside Dia. of PYREX Part 5/8" ¾" 1¼" 2" 2"
Outside dia. of terminal caps (brass) 1" 1¼" 1 7/8" 2 5/8" 2 5/8"
Developed leakage path 1 1/8" 2" 2 5/8" 4½" 5½"
Weight 2½ oz. 4½ oz. 15 oz. 2 lb. 2 lb. 3 oz. 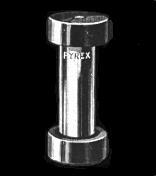 for heavy base support, etc., will be made to order. 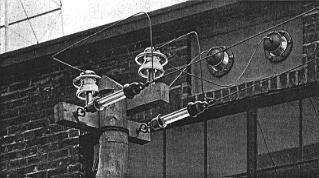 A group of PYREX Power Line, PYREX Antenna and PYREX Navy Type Entering Insulators at Broadcasting Station WLW, Cincinnati.